So the mu-so is a premium mainstream music system, expected to sell in far higher quantities than Naim specialist hi-fi but nowhere near as much as its Bose Wave price rival. It is better than the latter in every respect of course, and superb as £895 one-box systems go. It will never replace a Naim separates hi-fi system, but if it gets some owners into that full strength, Heisenberg hi-fi formula then its work is done! A large sturdy MDF box with DSP, networking facilities and six 75W amplifiers feeding six custom-made loudspeakers, the outer casing is lovely brushed metal (it feels like stroking a DeLorean motor car) and inside it’s crammed with circuitry, including an elaborate volume control which links to a top-mounted rotary knob with swish light show and touch-senstive panel. It’s an active design, each channel being fed by the 32-bit Cirrus logic CS47024 DSP, and to save space and reduce power and heat it six runs STMicroelectronics TA516B/STA311B 75W Class D modules. As you’d expect from a company so heavily invested in streaming, it sports an excellent uPnP streamer, plus aptX Bluetooth and a single TOSLINK digital input. There’s also a USB socket on the side which connects it up to the whole Apple biosphere – it will play out music digitally via an iDevice and lets you configure your Wi-Fi network settings this way too, giving Airplay as a bonus. There’s an app downloadable to control the mu-so and it transpires that it’s a lot better than the vestigial controls built into the top of the unit. Finally, for those stuck in the nineteen seventies there’s a 3.5mm analogue input which goes to the DSP brain via an A-D converter. Oh, and despite it being a Naim, don’t hold your breath while looking for the DIN sockets! The mu-so is a lovely thing, but doesn’t quite reach those giddy heights of Jacob Jensen-era B&O aesthetic and ergonomic perfection. Still, the quality of finish of this Chinese built unit is extremely good, and in no way does it feel like a toy. It’s quite big at 628x120x256mm and weighs a whopping 13kg; ideally it needs to sit on a coffee table or a shelf. 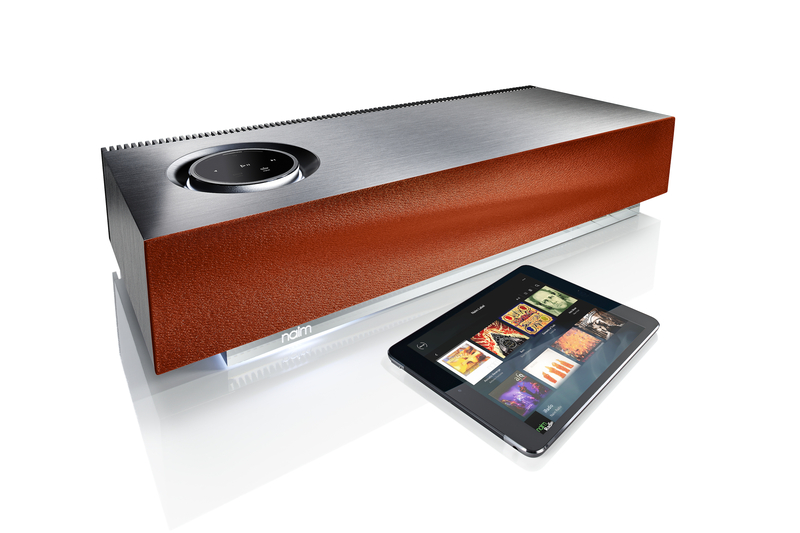 Its built-in DSP has a setting to reduce room boom, and also a built-in loudness control to, ermm, add it back! It sits on a translucent acrylic base which lights up in a trendy sort of way, and has ‘handles’ either side underneath which according to Naim aren’t actually handles after all! A black speaker grille is standard, but there are blue, orange and red options for an additional £69.95 apiece. The mu-so sounds brilliant for a one-boxer. It’s nowhere near as good as a grown-up hi-fi, but is miles ahead of the rubbish you’d expect from most single-box systems, expensive or not. It is genuinely powerful, punchy and animated; it’s easily transparent enough to show the difference in recordings and/or recording quality of the music it plays, and fills a largish room well. It’s a little boomy for my tastes (in my room it sounded like there’s a response hump around 120Hz), but it gets better as you move it out away from the rear walls. Impressively, it can deliver volume levels that would have a Bose Wave spontaneously combusting – or at least it feels this way. Treble is crisp, mid detailed and the low end solid and gutsy. Not much low bass, but what do you expect from an enclosure this size? Overall then, the new mu-so is an excellent product. It will doubtless find its way into many homes, with discerning middle class men loving the sound and wondering if their wives could ever let them buy a full sized hi-fi again – just like they once had at Uni. It does Naim’s name no harm whatsoever, and is a bold move considering the damage it could have wrought had it not been so comprehensively right. An addictive companion for those living the twenty first century wireless music dream, it soon becomes something that’s quite difficult to live without. Walter White would doubtless have bought one to play his old Eagles tracks on, but son Flynn would soon have sync’d it to his Samsung smartphone, blasting out Nine Inch Nails all day long!